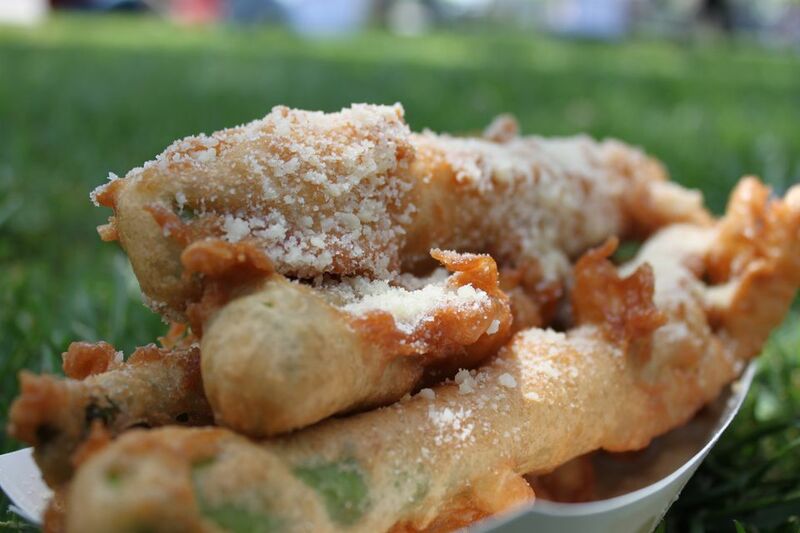 Festivals, carnivals, and state fairs have their share of strange fried foods, but you won’t see too many fried asparagus around. Unless you’re in Stockton, California. Fried asparagus may seem an odd sort of recipe, but it is, in fact, absolutely irresistible. And, as a once-a-year treat, it's really not all that unhealthy. At the annual springtime Stockton Asparagus festival (now known as the San Joaquin Asparagus Festival) they sell it by the ton: literally. They use huge, thick spears—reputedly the best tasting—but we find they don't cook through, so we use smaller spears, ideally 1/2-inch in diameter. After a bit of greasy indulgence, you might be interested in low-fat asparagus cooking and eating tips. Heat 1 inch of oil (peanut oil is best, but canola or vegetable oil will work) in a skillet over medium-high heat. Dip asparagus spears individually into the batter and fry for about 2 minutes or until golden brown. Dust generously with grated Parmesan cheese or dip in mayonnaise. This roasted garlic and paprika mayonnaise are particularly good. A pound and a half of asparagus may seem like a lot for two, but this asparagus is so good, you'll want to gorge on it. Do it for lunch and have a cold beer with it. You won't need anything else.